MILLION DOLLAR FISH Season 4 is upon us. Come to Darwin, Australia between October 1st, 2018 and March 31st, 2019 for your chance to win, with $2 Million dollars in prizes and 125 tagged fish. 20 tagged charity fish worth $5000 each, $2500 to thecatcher, $2500 to one of the 3 listed Northern Territory charities. Go ahead. key it into the currency converter over the rightside there to see how much AUD 1 million is in your currency. Then give us a call on +61447736007 to book your holiday in Oz. anglers from across the country, and in growing numbers, from across the globe, converge on Darwin for the sport and the prospect of catching at least one of the $10,000 fish and perhaps even the $1,000,000 million fish. 2 seasons ago, one man caught 2 x $10,000 fish. You are guaranteed a great time in the NT during this amazing fishing season. Pay for as many days fishing as you want, There is no maximum or minimum. Just be aware the competition ends on February28th, 2019.
or Contact us for more information or to make a booking. Daily half day fishing charter with Reel Screamin’ Barramundi Tours. Includes all fishing equipment: A quality, well maintained rod and reel, all tackle, lures and bait, plus instruction from a barramundi fishing professional. 3 Star (Standard) accommodation at Luma Luma Holiday Apartments or similar. Featuring a comfortable hotel with a pool from AUD $810 per person per day twin share. 4 Star (Deluxe) accommodation at The Mantra or Double Tree by Hilton or similar. Featuring Pool & restaurant.from $840 per person per day twin share. 5 Star Superior accommodation at Skycity Casino Hotel or Darwin Hilton. from AUD $870 per person per day twin share. Breakfast every day for the duration of your tour(hotel or external restaurant depending on class of hotel). Any entry fees associated with theme parks, excursions etc.if included with your tour package. All transfers in Darwin, including airport, hotel and fishing adventures. Because most flights arrive in Darwin in the very early hours of the morning, the fishing boats may depart early, and you maybe suffering jet lag, late start leisure activities can be arranged for the first day, and a relaxing evening meal, and retire early, all to give you a chance to recover and prepare for the fun of the next day’s fishing. Request ManYou Travel to book your flights for you. Purchase your own airline tickets and advise us of your arrival and departure flights and times and dates in writing so that arrangements can be made to suit your travel agenda. Private purchases, alcohol, shopping, souvenirs meals additional to the agenda and anything not specifically mentioned in the list of inclusions. Security arrangements: Celebrity travellers, if you need personal security, that will be an additional fee to be negotiated. What is AUD $1 million worth in my currency? Around USD $700,000, depending on the exchange rates. Please use the currency converter on this page to check for yourself, but it’s a lot of money in any currency! I’m not from Australia, can I still enter the competition? 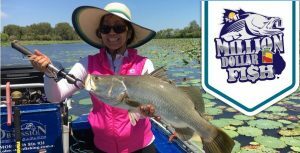 Yes, international entrants are eligible to enter the Million Dollar Fish Competition (and catch a tagged fish and receive the associated prize money). However, some minor prize pool draws in the event of the prize not being won may be open to Australian residents only. hotel prices. March-May/June is called “The Run-off” All the water that fell on land in the Northern Territory during the wet season (and that’s a LOT of water) is heading for the ocean via the rivers. This is an awesome time for fishing the swamps and rivers for Barramundi, because the males are heading downstream to find the females, and hungry predators are out in force waiting for the prey to head for the ocean with the river currents. See the tour pricing page or Contact us for more information or to make a booking. The rest of the year, when you get the best of conditions for Blue-Water fishing in the pristine waters off the Northern Territory. Blue water fishing charters are significantly cheaper than Barramundi fishing charters. Clean, blue water, unspoiled, unpolluted,and teeming with fish of monstrous sizes. The mangroves are also teeming with large predators, so you can take your pick, or even do both – a day of blue water and a day of mangrove fishing. ManYou Travel and its associates are not organisers of the Million Dollar Fish. We are promoters of Tourism in the Northern Territory and are offering tour packages including accommodation, meals and transfers between venues.